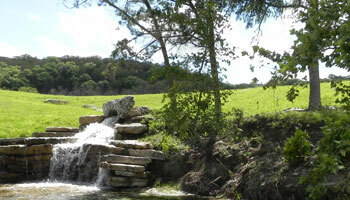 Lazy Hills is easily accessible from Austin, Dallas and San Antonio, yet remote from the pressures of life. Here on our secluded 725-acre Ranch, you can find the peace and relaxation you have been looking for. Lazy Hills is quickly becoming a favorite Hill Country venue for Retreats, Family Reunions, Conferences, Weddings, Equestrian Events and so much more. With our beautiful location and an abundance of recreational activities, we can help you have a highly successful and memorable experience. 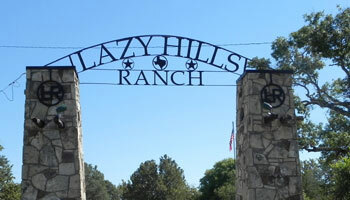 At one time, Lazy Hills was a wonderful western style Dude Ranch well known to generations of vacationing families in the Texas Hill Country. In 2010, with new ownership, we have preserved this rural flavor throughout the Ranch Property with our rock buildings, stone pathways, cozy dining hall and quaint updated guest rooms. We have gone a giant step further by adding beautiful spring-fed lakes, waterfalls, abundant recreational activities, meeting spaces plus a multi−purpose 6800 sq ft Pavilion - great for Weddings, Receptions, Banquets, Parties etc. When you come to Lazy Hills, you can expect to find all the lodging, facilities and amenities you need to enjoy your stay in modern comfort ... from dawn to dusk, the quiet, beautiful spaces of Lazy Hills will satisfy all your senses. Whatever your reason for coming, you will leave refreshed, renewed and rested. You will take a little bit of Lazy Hills home with you and leave a piece of your heart behind. Better yet, give us a call and inquire about a tour ... due to the nature of our business, we are not always able to perform tours ... however, we will accomodate the best we can and we appreciate you understanding this upfront. Copyright © 2010-2012 Lazy Hills Retreat & Conference Center All Rights Reserved.